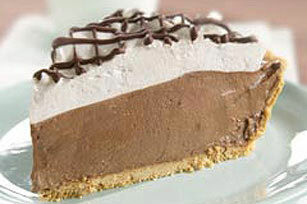 A creamy, marshmallow-y topping is the perfect complement to creamy, chocolatey pudding in this easy-to-make, no-bake pie. Microwave 2 cups of the marshmallows and 2 Tbsp.milk in medium microwavable bowl on HIGH 45 seconds; stir gently. (Marshmallows will be partially melted.) Refrigerate 15 minutes to cool. Add 1 cup of the whipped topping; stir with wire whisk until well blended. Stir in remaining 1/2 cup marshmallows. Pour 2 cups milk into large bowl. Add dry pudding mixes. Beat with wire whisk 2 minutes or until well blended. (Mixture will be thick.) Gently stir in remaining 1-1/2 cups whipped topping. Spoon into crust. Spread marshmallow mixture over pudding layer. Drizzle with melted chocolate. Refrigerate 4 hours or until set. Store leftover pie in refrigerator. Looking for something sweet? One serving of this easy-to-make dessert works well for an after-dinner treat. Prepare as directed, using JELL-O Vanilla Flavor or Butterscotch Flavor Instant Pudding.